"This novel tissue and organ printer is an important advance in our quest to make replacement tissue for patients," said Anthony Atala, M.D., director of the Wake Forest Institute for Regenerative Medicine (WFIRM) and senior author on the study. 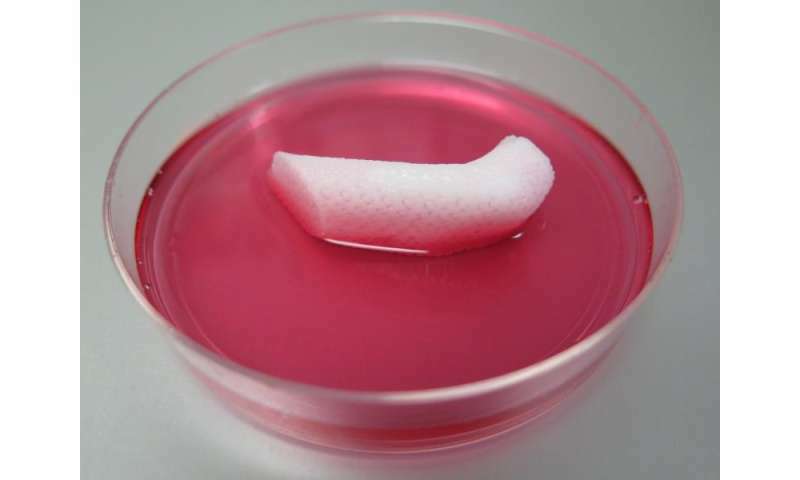 "It can fabricate stable, human-scale tissue of any shape. With further development, this technology could potentially be used to print living tissue and organ structures for surgical implantation." With funding from the Armed Forces Institute of Regenerative Medicine, a federally funded effort to apply regenerative medicine to battlefield injuries, Atala's team aims to implant bioprinted muscle, cartilage and bone in patients in the future. Tissue engineering is a science that aims to grow replacement tissues and organs in the laboratory to help solve the shortage of donated tissue available for transplants. The precision of 3D printing makes it a promising method for replicating the body's complex tissues and organs. However, current printers based on jetting, extrusion and laser-induced forward transfer cannot produce structures with sufficient size or strength to implant in the body. 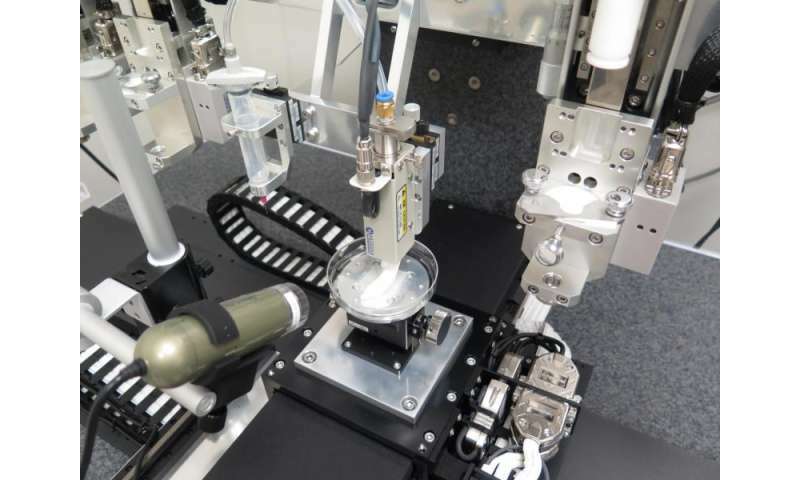 The Integrated Tissue and Organ Printing System (ITOP), developed over a 10-year period by scientists at the Institute for Regenerative Medicine, overcomes these challenges. The system deposits both bio-degradable, plastic-like materials to form the tissue "shape" and water-based gels that contain the cells. In addition, a strong, temporary outer structure is formed. The printing process does not harm the cells. A major challenge of tissue engineering is ensuring that implanted structures live long enough to integrate with the body. The Wake Forest Baptist scientists addressed this in two ways. They optimized the water-based "ink" that holds the cells so that it promotes cell health and growth and they printed a lattice of micro-channels throughout the structures. These channels allow nutrients and oxygen from the body to diffuse into the structures and keep them live while they develop a system of blood vessels. "Our results indicate that the bio-ink combination we used, combined with the micro-channels, provides the right environment to keep the cells alive and to support cell and tissue growth," said Atala. 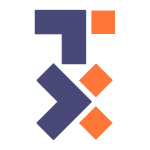 Another advantage of the ITOP system is its ability to use data from CT and MRI scans to "tailor-make" tissue for patients. 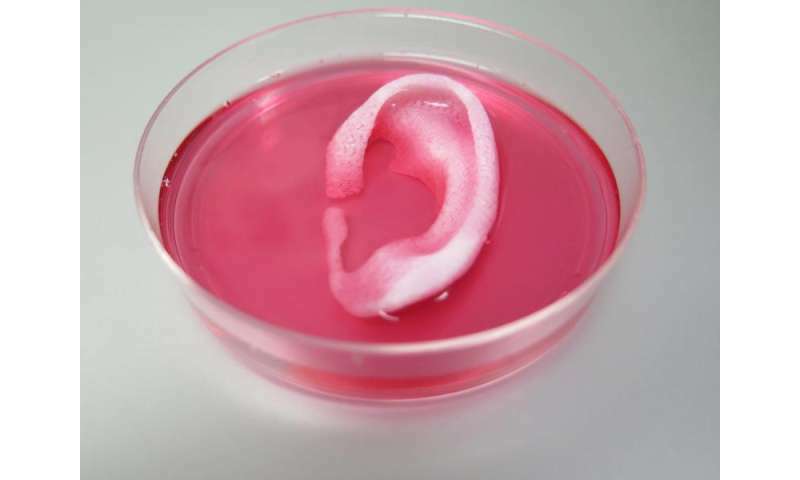 For a patient missing an ear, for example, the system could print a matching structure.